Op-Ed: How FAR will the Board of Supervisors Go? This is an opinion post by Reston resident Terry Maynard, who serves as the Co-Chair of Reston 2020. It does not represent the opinion of Reston Now. The newly re-elected County Board of Supervisors is at it again: They are proposing a “Priority 1” zoning ordinance amendment (ZOA) that would allow development density in a number of areas in the County to increase to a floor-area-ratio (FAR) of 5.0 plus a 0.5 bonus density for meeting key County priorities. The ZOA includes all of Reston’s Metro station areas (TSAs) and Lake Anne, a Commercial Revitalization Area (CRA). In fact, the ZOA proposal covers an entire alphabet soup of about 20 urbanizing and redeveloping “Selective Areas” across the county: TSAs, CRAs, CRDs, CBCs, PDCs, and PRMs. Together, the County calls all these “Selective Areas” and the ZOA makes no distinction among them. That’s a potential half billion gross square feet (GSF) of new development and redevelopment added to the County’s current roughly one billion GSF of total existing development of all kinds. And the “Selective Areas” cover only about five percent of the county’s total 400 square mile area. If you are interested to learn about this proposed ZOA, there are opportunities for you to hear more and provide your comments as early as this Wednesday, Jan. 13. While the draft language proposes to limit such approved density to the limits “in the adopted comprehensive plan,” experience has shown that this kind of seeming constraint has frequently been ignored in specific applications, for example, through such seemingly routine legal maneuvers as a “density swaps.” The Comprehensive Plan — a legislated guide to development, not a legal constraint — is routinely ignored when it comes to fulfilling its own quality of life standards. In short, this ZOA opens the door for very high-density development that substantially exceeds the major increases that the Board has already approved in the County’s Comprehensive Plan for these “Selective Areas,” including Reston. So what does FAR 5.0 look like? To start with, no existing buildings or areas with that density exist in the County, although some such buildings will soon be coming to Tysons. 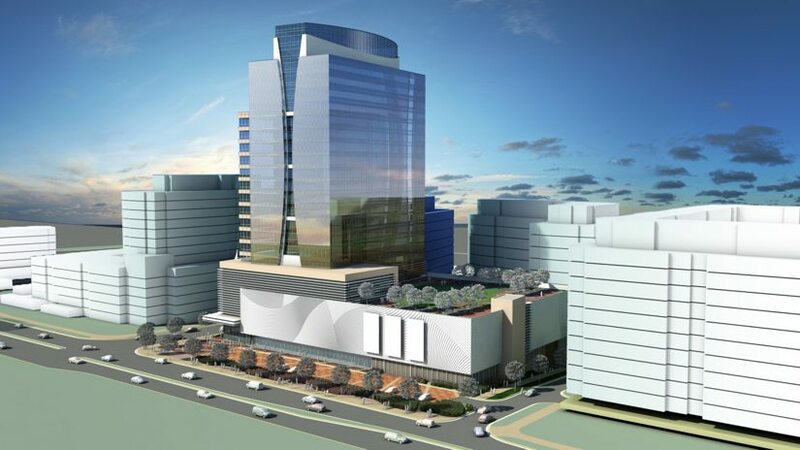 The most densely planned structure in Reston now is the Akridge office building, the 23-story office building approved at a FAR of 4.06 to replace the current Town Center Office Building, including five levels of parking and first-floor retail. That building is located at 1760 Reston Parkway. Also, Boston Properties has developed a conceptual plan for its property near the north side of the Reston Town Center station. The plan calls for a FAR 4 density, probably with a FAR 0.5 bonus density, when it is built. The entire area in that image is also planned for FAR 4 development under the Reston Master Plan precisely because it is located so close to the Metro station. The most densely developed TSA in Virginia is the core area around the Rosslyn Metro station. Overall, that core station area has a density of FAR 3.6 (see photo). Its two tallest buildings, twin 390′ 31-story structures — one office, one residential — directly above the station, are FAR 10. So the County proposal is explicitly trying to address a problem that doesn’t exist and almost certainly won’t for at least a decade or more even under the most enthusiastic of County growth scenarios. Right now, office vacancies are running above 17 percent and the housing market has been stagnant for at least two years with a small average price decrease in the last year, according to the Economic Development Authority and the County’s Economic Indicators. Nonetheless, the foreseeable consequences of FAR 5.0 development are huge, and many consequences are not foreseeable so far in the future. Certainly one of the most obvious impacts of increased density would be greater traffic congestion. In the case of Reston’s planning task force, the County’s transportation staff examined the traffic impact using a forecast generated by MWCOG (Round 8.0), the regional inter-governmental planning group. It foresees Reston Town Center densities of FAR 3.0-4.0 north of the Dulles Toll Road (DTR) and FAR 1.5-3.0 south of the DTR in 2030. Nowhere does that forecast suggest that FAR 5.0 densities would be approached in Reston. The study showed that half of the 16 intersections along the DTR crossings in Reston would have a failing Level of Service (LOS) grades of “F,” including four of the six along Reston Parkway, in the evening peak rush period (see graphic). Meeting current County standards for schools and parks would also be virtually impossible with a FAR 5.0 in Reston’s 2-1/2 TSAs (half of Herndon-Monroe TSA being in Herndon) with the County’s coffers as empty as they are expected to be. To meet that development level, Fairfax County Public Schools would have to build 3-5 elementary schools, one intermediate school, and a high school — presumably some of which would be located in the TSAs — to serve the expected 25,000-39,000 students (part of the 59,000-93,000 residents in these FAR 5.0 TSAs). The County Park Authority would also have to provide 100-150 acres of parks and dozens of athletics fields to meet the needs of the residents and workers in these areas to meet park goals in the Comprehensive Plan (see Appendices 2 & 3). The Park Authority has abandoned any pretense of meeting the Comprehensive Plan’s Urban Park Framework park acreage goals or the Park Facility Service Level Standards for Reston’s TSAs even in the current Reston Master Plan. And the single new elementary school proposed in the current Reston plan is proposed to be located less than one-quarter mile from an existing one (Dogwood) south of the DTR and more than a mile from where it will be needed north of the Wiehle-Reston East Metro station. In short, experience shows the ZOA would create more quality of life of problems across the County than the County could or would address. So why should Reston residents expect the Board of Supervisors would try to meet its own legislated community service standards for Reston or any other “Selective Area” under a zoning ordinance offering developers the opportunity for an even more profitable density of FAR 5.0 and the County greater potential property tax revenues? The record so far has been one of consistent County failure to meet its quality of life standards for our communities in redevelopment, including Reston. That said, Restonians and other County residents will have a chance to listen to more about this proposed ZOA as well as ask questions at two meetings within the next two weeks. The first meeting is sponsored by the Fairfax County Federation of Citizens Associations (FCFCA). It is holding a workshop on Wednesday, Jan. 13, 7:30 to 9:30 p.m. at the Providence Community Center, 3001 Vaden Drive, Fairfax. After an opening introduction providing context to the proposal, a panel of citizens will discuss the impact on their communities followed by an open forum in which people may ask questions, offer suggestions, etc. The second meeting is the official Fairfax County “public input” session at 7:30 p.m. on Wednesday, Jan. 20. The meeting will be held at the Board Auditorium in the Fairfax County Government Center at 12000 Government Center Parkway, Fairfax. This is not a public hearing. It is an informal input session. I strongly recommend that you attend one or both of these meetings to learn more about this important planning and development issue.